I haven't done any baking for absolutely ages, so when Dave asked me if I could make a cake for a charity cake sale at his office, I was quick to agree. After going to and fro with ideas, I settled on cupcakes. After all, everyone loves a cupcake, don't they? I wanted to make something which would stand out from the crowd, which meant something fruity as there's always guaranteed to be lots of chocolate-y and vanilla-y cakes. I'm not sure how I came to settle on blackcurrant, but I'm glad I did as they tasted absolutely fantastic! 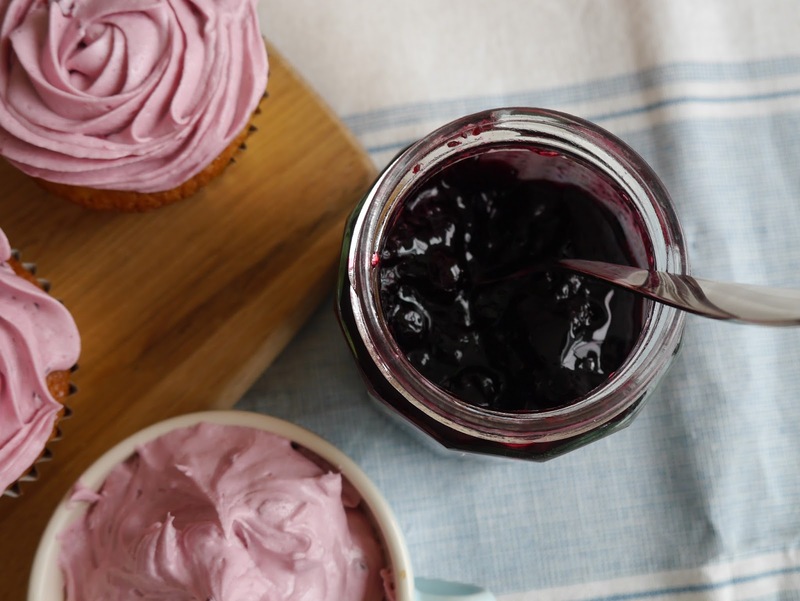 If you want an extra hit of blackcurrant flavour--although, I suspect it may push it into too sweet territory--then you could add a spoonful of jam to the centre of each cake after baking or perhaps cut the sugar by 20g or so and add a heaped tablespoon of jam to the cake batter. Everyone seemed to love the cupcakes; apparently they sold out really quickly and overall the cake sale raised £171.20 for The Brain Tumour Charity which I reckon is pretty good going! In the bowl of a free-standing mixer with paddle fitted (or using a bowl and electric whisk) combine the flour, baking powder, caster sugar, salt and butter. Mix on a slow speed until a crumb texture forms. Beat the milk, eggs, and vanilla extract together in a jug. Slowly pour half the mixture into the crumbs. with the beaters on slow speed, until mixed in. Then turn the speed up to medium and beat until the batter is smooth. Turn the speed down to slow again and slowly add the rest of the wet mixture. Divide the batter between the muffin cases in the prepared tin. Fill each one about 2/3 of the way. Bake for 20-25 minutes until risen, lightly golden on top and the top springs back when pressed gently. Allow to cool in the tin for a couple of minutes then transfer to a wire rack to cool completely. 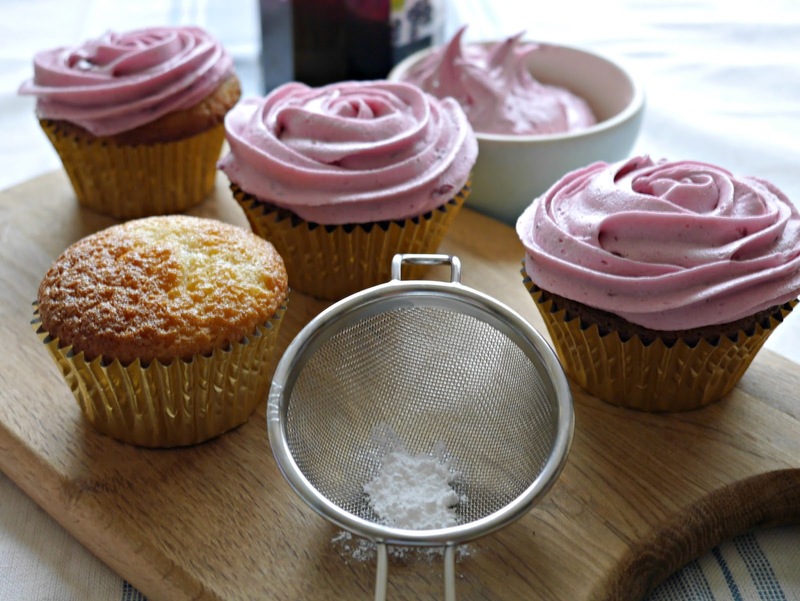 In your free-standing mixer, combine the icing sugar and softened butter. Cover with a tea towel to avoid redecorating your kitchen!! Mix on low speed until the butter is worked in--it'll have a crumb-like texture--slowly mix in the blackcurrant jam and then dribble in the milk until you have a buttercream consistency. Add a pinch of salt to cut through the sweetness somewhat. Raise the speed to medium and beat until soft and fluffy. (I usually close the kitchen door and let it run for at least 8 minutes.) Add more milk if you think it needs it but be careful not to make the buttercream too soft if you're piping..
For a rose swirl, I use a Wilton 1M tip (open star) and start piping in the centre of the cupcake. This uses less buttercream than the traditional Mr Whippy swirl so you might have some buttercream left over. Here's a video which shows how to pipe the rose swirls. It's really easy and looks amazing. Your frosting is so perfect! They look so so good! These look so darn good Angela!! Your icing technique is pretty spot on! !